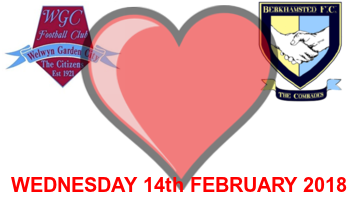 The top two in the SSMFL Premier Division met yesterday as Berkhamsted welcomed Welwyn Garden City to Broadwater. It was a great afternoon for The Citizens as they ran in four first half goals to record a convincing victory with Daniel Bond, Ashley Kersey and Paul Marks (2) hitting the back of the net in front of a good crowd of 233 people. Third placed Leighton Town's FA Vase Fifth Round game at Wolverhampton SC was postponed and is now scheduled to take place next weekend. The Bedfordshire club may well have something to say in the race for the title as they have won their last eight league games in a row. What may be important is the points per game (PPG) total for the sides as there are extra promotion spots available from Step 5 with the non-league re-organisation due to the summer. Fourth placed Harpenden Town won 3-2 at home against London Tigers with their goals coming from Dwayne Duncan, James Ewington and Sam James. There are some huge games coming up over the next month none more so than Valentines Night at Herns Way when the current top two clash for the return fixture from yesterday's game. The following week The Citizens travel to Leighton Town with a tricky looking trip to Biggleswade FC in-between.